6 Pocket Armrest Organizer Only $7.99 Down From $19.99! Ships FREE! You are here: Home / Great Deals / 6 Pocket Armrest Organizer Only $7.99 Down From $19.99! Ships FREE! GearXS has this 6 Pocket Armrest Organizer on sale for $7.99 (Reg. $19.99) when you use promo code 2OFF + FREE shipping! Accessorize your Favorite Seat at Home. 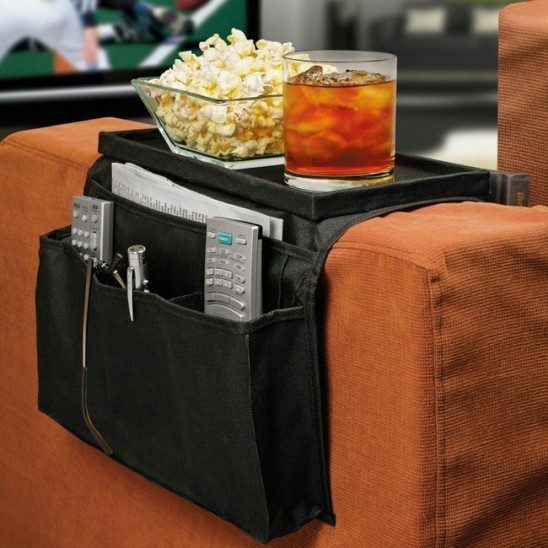 The Armrest Organizer is the perfect addition to any family room couch or chair. With 6 built-in compartments, this versatile organizer stores remote controls, eyeglasses, program guides, and other belongings neat and tidy right at your favorite seat. The organizer also features a 11 x 6 inch table top perfect for food, drinks, note taking and more. Armrest grip adjusts to fit any size couch or chair in seconds.